Gungjung Tteokbokki is a Korean royal court cuisine that originated from the royal palace in the Joseon dynasty. Gungjung means “palace or royal court” in English. It is known as king’s snack. 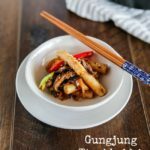 Unlike typical Tteokbokki (Korean spicy rice cakes), Gungjung Tteokbokki is not spicy but rather savoury. If you are familiar with Korean food, you have probably heard of Tteokbokki (떡볶이). Typically Tteokbokki means Korean spicy rice cakes. 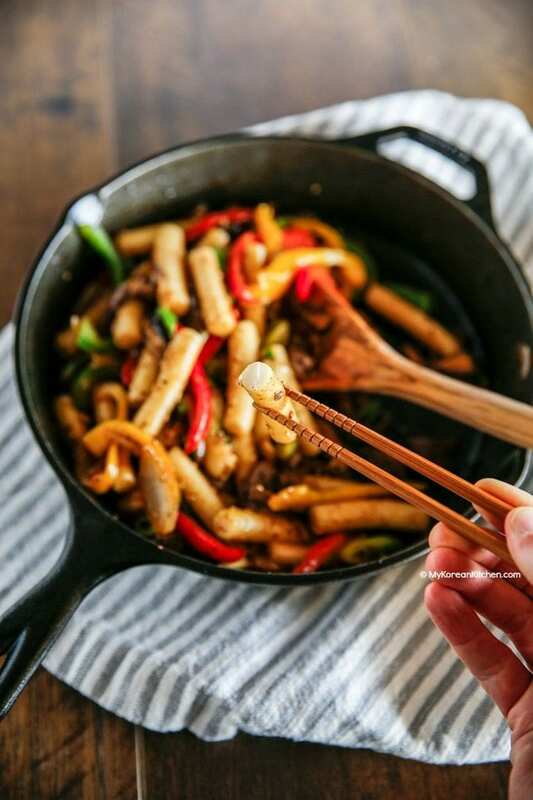 White cylinder shaped rice cakes are stir fried with Korean fish cakes and Korean spicy sauce. On the other hand, Gungjung Tteokbokki (궁중 떡볶이) is cooked with a soy sauce based sauce, so some people call it Ganjang Tteokbokki (간장 떡볶이). Ganjang means soy sauce in English. The dish typically includes white rice cakes, some meat (mostly beef) and various colourful vegetables. So it looks and tastes more luxurious than typical Tteokbokki. The taste is slightly salty and savoury. It is one of my daughter’s favourite dishes. 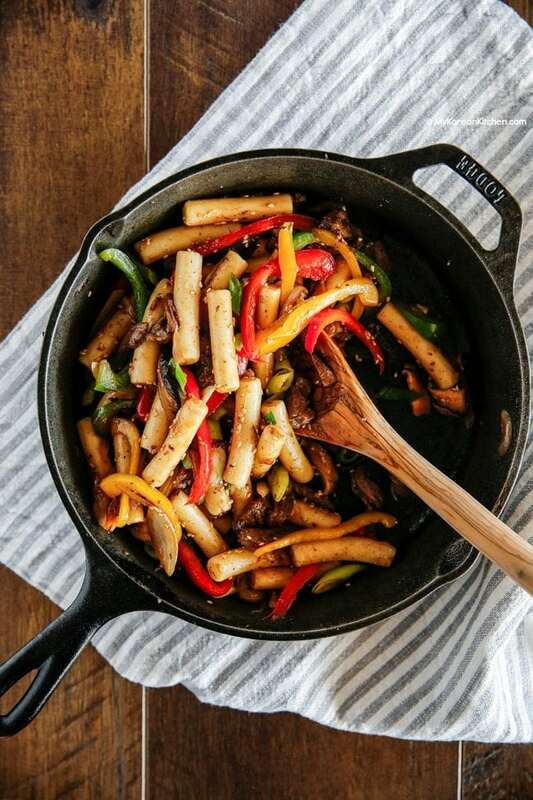 She’s only little, but she can easily carve out half of these rice cakes and mushrooms. Between my meat loving husband and my daughter, I typically end up with bell peppers and onions. Lol. 😉 I hope you enjoy it too! **If you want to learn more about Korean cooking ingredients, check my 30 essential Korean cooking ingredients. 1.Combine the meat with the marinade. Set aside while other ingredients are being prepared. 2. In a heated pan (on medium-high heat), add some cooking oil and the onion. Stir lightly until they are wilted. Add the meat and cook briefly (about 30 seconds) until the outer layer is cooked. 3. 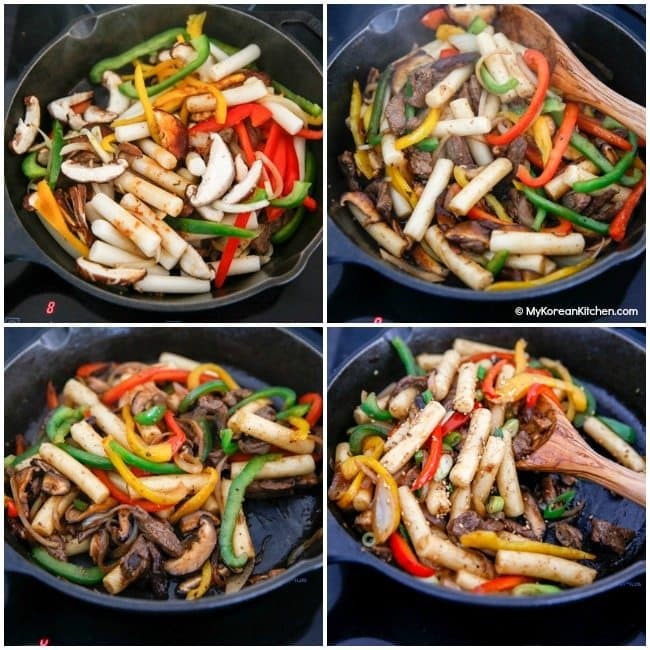 Add the mushrooms, rice cakes, bell peppers and the seasoning sauce. Stir them well until all are cooked (about 2 to 3 mins). 4. Garnish with the green onion and roasted sesame seeds. Serve. Update: This post was originally posted in October 2006 and it is now updated with clearer instructions and better photographs. Gungjung Tteokbokki is one of Korean royal court cuisine originated from the royal palace in the Joseon dynasty. It is known as king's snack. 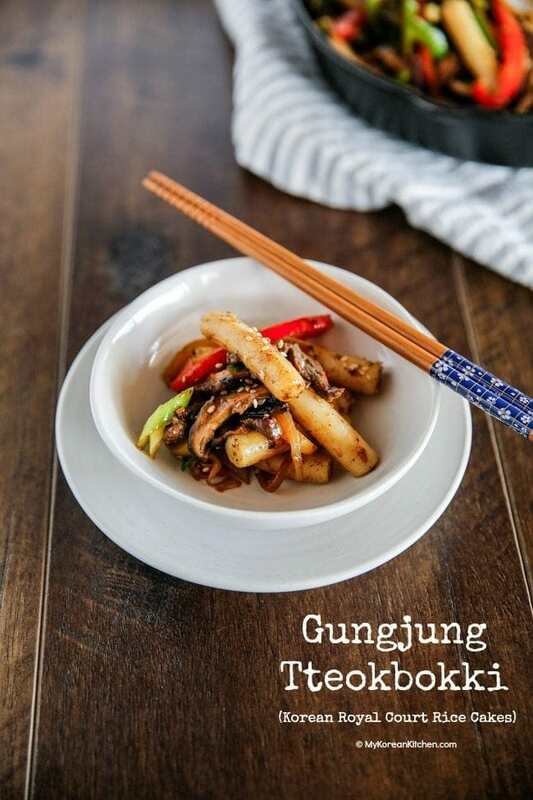 Unlike to typical Tteokbokki (Korean spicy rice cakes), Gungjung Tteokbokki is not spicy but rather savoury. Combine the meat with the marinade. Set aside while other ingredients are being prepared. 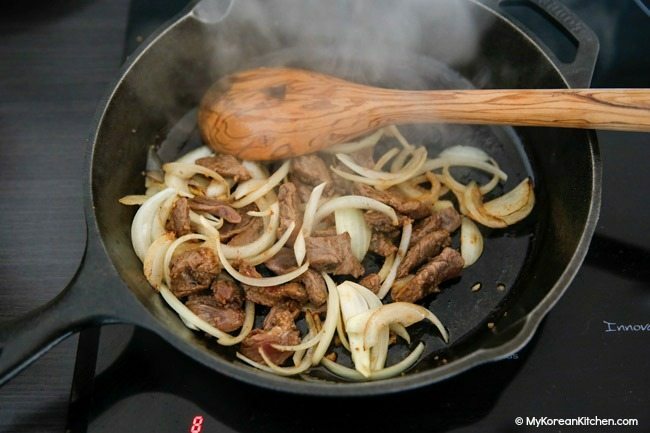 In a heated pan (on medium-high heat), add some cooking oil and the onion. Stir lightly until they are wilted. Add the meat and cook briefly (about 30 seconds) until the outer layer is cooked. 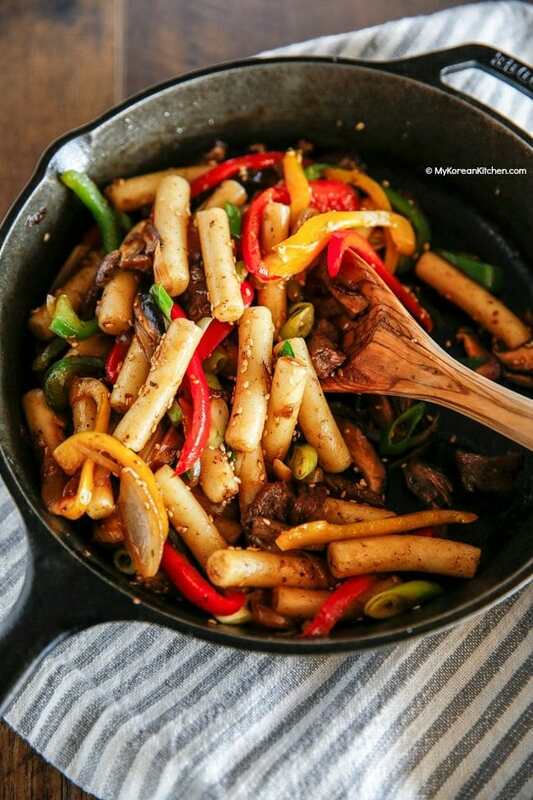 Add the mushrooms, rice cakes, bell peppers and the seasoning sauce. Stir them well until all are cooked (about 2 to 3 mins). Garnish with the green onion and roasted sesame seeds. Serve. Made it yesterday, my husband loved it. So delicious and so easy to prepare too. Thanks for sharing it! I’m loving all your recipes! I hadn’t made this in awhile, but this time I added a bunch of random stuff (so I guess besides my kitchen-sink japchae I now make kitchen sink gungjung tteokbokki…?). 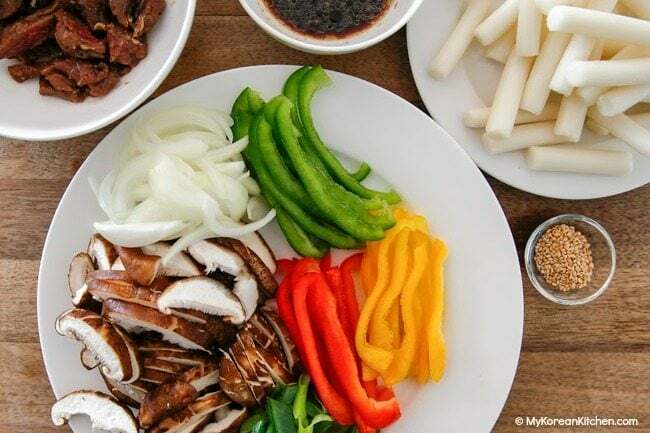 I don’t like onions or bell peppers so my ingredients were the tteokbokki (of course), beef, shiitake, wood ear mushrooms, enoki mushrooms, carrots, green onions, garlic chives, ginko nuts, and some of the Korean pickled yellow radish (what is the name of this by the way? I threw the package away so I can’t go read it ^<__<^;; ). I stirfried all the veggies (and the enoki) separately from the meat, tteokbokki, and other mushrooms and omg it smelled so delicious, even my mum agreed (and she generally can't stand my cooking). Seriously, that’s a lot of random stuff. 😉 Korean yellow pickled radish is called danmuji (단무지). Glad to hear you’re cooking lots of Korean food! Made this for dinner tonight. Family loved it. Next time I will need to double the.recipie! Hi Sue, Looking forward to trying this recipe out for sure! I’ve only cooked with rice cake twice and loved the texture. Oh my God this is the best. Slightly salty and savory? I am in. So easy to make. I love Sesame seeds. It adds a taste and aroma that is out of this World. Sue the photography is just so amazing, Makes you want to make it right now. Thanks! Hope you give this a try soon! …. thanks for this site… i was able to find the rice cake recipe and tried it myself …really tasted good! I know that this is a late reply. But I made this recipe yesterday nite and I quite enjoyed it. For spice, I added the Korean spicy sauce that comes in the red container. Oh goodness! I love your site and how easy the recipes are. I love the pictures too. Thank you for your wonderful recipe! Thanks for your detailed description! It is possible to make rice cake yourself, but it is going to take a bit of your effort. I think it is better that you go to a Korean restaurant in your town, and ask where to get those Korean ingredients. hello again, just wondering if it is possible to make rice cake by myself?? ?…because i think i won’t be abble to find any in switzerland..